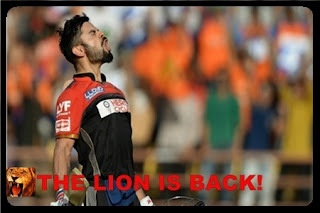 Breakin News India 360: Virat KohliI THE LION IS BACK!!! Virat Kohli made his 22nd IPL fifty in his comeback game and looked supreme touch from the very first ball. Virat played a wonderful knock of 62 runs from just 47 balls he faced. The Lion is back! : Fit-again Virat Kohli marked his return to Royal Challengers Bagalore team in an attempt to get back challenging for top 4 spot in match against Mumbai Indians at Bangalore on Friday. Virat Kohli made his 22nd IPL fifty in his comeback game and looked supreme touch from the very first ball. Virat played a wonderful knock of 62 runs from just 47 balls he faced. He was great batting form in the 2016-17 calendar years with 4 double centuries in Test Cricket, but he failed to score runs against Australia only. But again he shows how to come back. He was the Top scorer of last season IPL 2016 with 973 runs including 7 half-centuries and 4 brilliant Hundreds. And he taken RCB for the final of that season, but they lost against Sunrisers Hyderabad. Kohli should make runs for the RCB team to repeat, what they done in the last season and win the title to come out from worst team branded as early season laggard. 14 April: Mumbai Indians have won the game by 4 wickets 7 balls to spare against Royal Challengers Bangalore in Chinnaswamy Stadium at Bangalore. Mumbai Indians won the toss and elected to bowl first, But Royal Challengers Bangalore got started good. Chris Gayle and Virat Kohli both are batted well and joins the 63 runs in 9.2 overs for first wicket. Virat also batted well and he scores 62 of just 47 balls in his comeback game. AB de Villiers short to score a good innings. Overall you can say Mumbai Indian's bowlers bowled well, kept Royal Challengers Bangalore's batsman quite and able to restrict them to 142/5 in 20 overs. Mumbai Indian's bowler Tim Southee gets 2 wickets for 23 runs and McClenaghan 1 wicket for 20 runs in his 4 overs. The Lion is back! : Fit-again Virat Kohli marked his return to Royal Challengers Bagalore team in an attempt to get back challenging for top 4 spot in match against Mumbai Indians at Bangalore on Friday. Virat Kohli made his 22nd IPL fifty in his comeback gameand looked supreme touch from the very first ball. Virat played a wonderful knock of 62 runs from just 47 balls he faced. Mumbai Indian when came to chase down the low total of 143 runs for win, they didn't felt one bowler name of Samuel Badree will make them hurt early in the innings. Mumbai at one stage 7/1 in 2overs, but after one 2.4 overs Mumbai 7/4 because of Samuel Badree. He took three wickets in a row in an innings 3rd over. 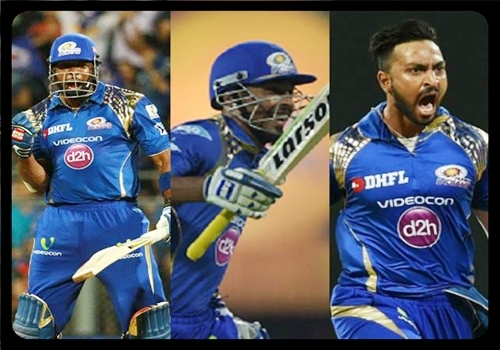 However Pollard and Krunal Pandya played a match winning partnership of 97 runs. Kieran Pollard played a great knock of 70 runs from just 47 balls here in Chinnaswamy Stadium at Bangalore, another side Krunal Pandya gave him a good support and played another good knock of 37*(30) and remained Notout. Finally Mumbai Indians was able to win this game by 4 wickets in 18.5 overs. Samuel Badree Hat-trick: Samuel Badree became the 12th man to take Hat-trick in the IPL by dismissed Parthiv Patel, Mictchel McClenaghan and Rohit Sharma in a row in 3rd over of the Mumbai Indian's innings.